I took an unintended trip down memory lane last night. It started innocently enough (as they usually do) when I was going through the The Great Software List. There are so many great programs in this comprehensive list and I was scanning them when something caught my eye that created an instant flashback. Looking through the list of note taking apps and PIM apps the author’s descriptions said similar things for several different programs. 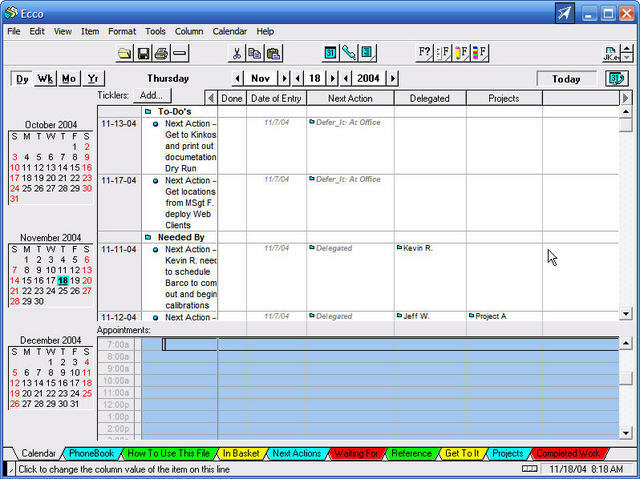 He referenced how these programs offered similar functionality to Ecco Pro. Talk about a program long forgotten. Ecco Pro was a program that when it was introduced in the 1990’s defied categorization. It was a PIM program, no, it was a note taking program, no it was a project manager, no it was an outliner, no, maybe an organizer. The truth is Ecco was all of those things and more and that was probably the downfall of the program. Ecco was so customizable that each user could tailor it to fit the way they work. You could change almost everything with this program and have your information displayed any way you wanted. This total flexibility turned off many new users as they were often overwhelmed by the program. But Ecco allowed users to save their views layouts in template files and diehard Ecco fans shared those templates in Ecco forums. This helped get newbies going with the program and also demonstrated how much you could really do with this programming masterpiece. NetManage, the company behind Ecco Pro, went out of business in 1997 and Ecco Pro went with it. I stopped using it shortly after that because my data was just too important to risk on an unsupported program. Like all cool programs that fade away it was eventually forgotten even though I have never run across a program that can do as much with personal information as the late, great Ecco Pro. I haven’t even heard a mention of the program in years so I chalked it up as another great program ahead of its time that faded away. Or so I thought. My journey last night got me to thinking so I started searching online for any mention of Ecco Pro. I thought I might find some historical stuff but I was instead completely surprised. It seems that Ecco Pro is alive, if not well. There is an entire community of diehard Ecco heads out there that not only still use the program but are actively designing templates to share with others. The last version of Ecco Pro is available free and downloadable. It is a fitting tribute to a great program that it can survive seven years with no development and no programming support. Needless to say I downloaded and installed it if for no other reason to bring back those fond memories. I have to tell you this program still rocks! There is no better program I’ve seen for letting you customize exactly what data you want to keep, how you want it organized, and how to present it to you for viewing. One of the original diehard Ecco template masters, Wil Ussery, is STILL designing templates and sharing them on the Yahoo Group that is dedicated to Ecco Pro. I installed his latest template that was created this month and it is a complete implementation of David Allen’s Getting Things Done methodology. The old standby Ecco Shooter is still there too. Just take a look at the screen shots to see how far this ancient program can still be pushed. I don’t know if I will actually use Ecco as my data is firmly entrenched in the Outlook/ OneNote arena but if Ecco could handle ink I might seriously try it. What a great program and so far ahead of its time it was doomed for failure. It was a great trip down memory lane. Let me correct some information regarding the EccoPro discussion forums on Yahoo. A couple of months ago, some folk were concerned about several issues, including spam and email harvesting bots. Some spam had begun creeping into the group because the owner of the group had become distracted by “real life.” I didn’t think that the spam had become unwieldy, amounting to perhaps 3-6 a couple of days per week; but some folk did. Some folk also became concerned about supposed email harvesting bots, though no documentation was ever provided that bots were actually subscribed to the group. A group of those concerned about these two issues created another group, which still exists. But the owner of the original group was finally contacted, and has designated a co-owner, who has designated several moderators. With this change, the original discussion group is now as free of spam as any internet discussion group/list can be, and the issue of email harvesting bots is being addressed. Anyone interested in joining the group is invited to do so. The group’s homepage on Yahoo is at http://tech.groups.yahoo.com/group/eccopro/. If you are having problems installing EccoPro, you might try downloading the manual install packet and copying the files manually into their proper directories. You can get this packet at http://www.eccoforum.com/viewtopic.php?t=8&sid=428c25421976afd2d6c105979e21d18e. The owner of compusol has gained control of the old eccopro forum. Likely if you post in the forum and be sure to use hidden email because the forum is email harvesting bot infested he would help you. Peter could you please post the instructions for how to do a manual installation on Windows XP and Vista ?? It failed to install properly for me on Windows XP. I paid CompuSol their $10 and never received access to “their kit”. I emailed them about this 3 times already and have heard nothing. What a ripoff!!! I am fed up with CompuSol. I still want to run ECCO Pro. CompuSol responded in a timely manner and forwarded the access code. Please check your spam filter. Yes Ecco works with Vista, I have it right here on my new Vista PC and its as solid as ever. It might be a struggle to install through its setup.exe though – for some people, setup failed to run under XP, so Vista is probably even more problematic. The alternative is a manual installation, using files and instructions from – unpack files to their correct folders, run a .reg patch and it’s done. There is a brand-new automated installation package at http://www.compusol.org/ecco/ which contains automated installations for users of Windows XP Service Pack 2 or 3 or Windows Vista and Windows 7 32-bit and 64-bit who might have problems installing EccoPro with the downloaded 16-bit “setup32.exe” or for users who get the famous “GLBSSTUB” error. The package will install all necessary registry entries plus the “default.ect” template fix. Does anyone know for a fact if EccoPro works with Windows Vista? Glad I found this webpage! Ecco is G-R-E-A-T! Thanks. (including a lot of fee software to upgrade Ecco for windows XP. GO TO THEIR FORUMS where for some reason they have hidden the bulk of their software, especially the FREE SOFTWARE. Was surprised to find there software for allowing color highlighting for schedules, using the mouse wheel, fixing year 2000 bugs with Ecco, creating networks, etc. I’m a long term fan of Ecco also, ever since 1993. Since the beginning, I saw it’s power and limitations. I’m putting the finishing touches to my version of Ecco Pro, called SQL-Notes. It has most of what Ecco had plus much more (presentation, advanced search, analysis tools, office links, true Gantt charts, user functions, true multi-user, autoassign with an Office 2003 look and feel). ECCO is STILL heads & shoulders above anything else for all that it does. While there are some programs that may do a better job of ONE of the things ECCO does, there is no single programs that covers ECCO’s suite of capabilities. Zvi Alon is far and away one of the largest executives showing a total lack of foresight and confidence that has come down the oike in 30 years. Why he allowed further ECCO develpment to cease is still a mystery. EccoPro was abandoned in Windows 95. I now use it on Windows XP. There are some things that Ecco Pro does not do well. There is a “SUM” function, but the results have to be manually re-entered in the location you want them to be. The shooter locks up my computer now and then. Some views will not scroll properly. The Internet functionality is really dicey. My compromises: A utility program called “Katmouse” solves the scrolling problem. I don’t use the shooter. I manipulate files and view so that I have more control when I calculate lists . I don’t use EccoPro to access the Internet. OK, now that I’ve stated the problems, I’d like to praise to the skies this program which still works better than most new programs. I use it to run complicated construction projects. I use it for estimating (although the limited SUM function makes it cumbersome.) I use it to do mockups of databases whenever I need to think through a new concept. I use it as a customer relationship manager, calendar, task list, to-do manager, and most anything I want. And the interface is still first rate. One overlooked ability Ecco Pro has is the ability to connect files, allowing you to take items on a list and choose different destination views. In other words, you can have a master list which contains all the items, and sub-lists which contain selected items. In this way I can create a master estimate containing all possible costs, and sub-estimates which contain selected costs. I haven’t found any other program which have this flexibility. It takes me only a few hours to mock up a new database whereas it might take days or weeks in a database program. The other thing which keeps me using EccoPro is that all information is accessable and editable from any view or window. Ecco Pro does not hide information away in hard to find places. It is not burdoned with dialogue boxes. Just me and the information, any way I want to present it. I’m always looking for a replacement because, after all, it is abandonware. I just haven’t found it yet. One interesting program which came up in my last web search was a Mac program called “Omnilist.” It is also an outliner and uses columns similarly to Ecco Pro. However, Ecco Pro still just does so much more. I cannot comprehend how this program got left behind. I teach students how to use MS Office and Outlook, but I use Ecco for all my stuff. (Even Office 2007, Outlook 2007 and OneNote haven’t changed my mind.) Ecco is great!. ECCO still has no peers. I’ve been using Ecco 3.0 for 10 years, and (recently) was happy to see that the 4.0 was available as unsupported free-ware. I mostly use Outlook 2003.However everything of IMPORTANCE I cross enter into Ecco. Outlook is a monthly scratch-pad for me-the long term info that I have preserved over a decade is within my Ecco backups. 1) The “EccoPro Wiki Home” which allows visitors to follow discussion threads, post messages and ideas, serving as an early platform for the EccoPro Open Source Project. 2) Fresh implemented easy access per index pages to the EasyEccoTutorials. 3) New packaged password free “Ecco Add On” downloads of the old 16-bit Catalyst Tools, Forms and Reporter. 4) Re-designed menu areas including the ability to edit your membership data. I just uploaded my latest GTD template 1.7 to the Ecco Pro Newsgroup. Several enhancements. Ha Ha…I still use Ecco Pro every day !!!! I have never found a program that does what this does with the same ease. Have you ever really tried keeping lists of things by category in MS Word outline mode..its horrible. I pray every time I upgrade my OS that Ecco still works..I would be lost without it !!!!!!!!!!! Todd, just wanted to let you know that the template has gone through a couple of revisions since your review. I have added considerably more functionality to the GTD template. It currently is at 1.6, which I will be uploading to the Yahoo Newsgroup today. Some of the enhancements are Forms for data entry, additional filters that can be used in multiple notepads, Delegated Projects Notepad to monitor projects you have assigned to someone else, with additional filters for this view, added a Planning as a Deferred Action. There are others, but the template is really looking pretty good right now. I wish the there were more people on the GTD forum that use Ecco Pro, because the functionality that they’re looking for is embedded within my template. Check it out and drop me a line, if there’s something you think is missing or is not working properly. Todd, thanks for the positive review of the GTD template. I’m looking for ideas to enhance the template, so if you have any please pass them along. The General Counsel of NetMange has recently posted to the ECCO PRO forum on Yahoo that NetMange is thinking of open sourcing ECCO. A lively discussion ensued. Check it out at Yahoo Groups if you are interested. I use the template designed by Dave Gustafson that I got from the Ecco Pro group. I like Will’s template also, and would use it if I didn’t already have the one by Dave. NetManage dropped Ecco Pro when Microsoft announced that it would be bundling Outlook *free* with MS Office 97, and it became clear that MS was going to own the PIM market. NetManage literally finished up the 32-bit version of Ecco, and then pulled the plug in direct response to the Outlook launch. Ecco Pro was and still is one of the most amazing pieces of software. I use Mac OS X now, and there are some reallly good outliners (and PIMS) available, but there’s still nothing that has the full range of amazing stuff that Ecco does. NetManage dropped it because they could not make $100 million a year selling it. They had the mentality that software must be a blockbuster, otherwise there’s no reason to keep it going. Paul, I sure thought NetManage went out of business. Why did they drop Ecco then? Todd, do you use a special template with Ecco or one you developed? I have used Ecco Pro on my Tablet PC and it works fine. The program isn’t ink-aware (obviously), but the new TIP in SP2 makes entering info with the pen fairly quick and easy, just like any other non ink-aware Windows app out there. Just to clarify — NetManage did *not* go out of business. They just discontinued Ecco, and have not shown any interest in opening the source, for whatever reasons. There have been a few attempts to approach them about purchasing / opening the code, but as far as I know to no avail. I’m real curious to hear about your results with the inking. I’m not tabletized yet, but I’m hoping to be in the next couple of months. I haven’t really researched if the source is available somewhere. Have you looked for it, Shawn? It’s really too bad that the source code for great apps like these just disappears when the companies go out of business. Image what might have happened if NetManage had open-sourced it when they died. Or if all companies were required to escrow their source somewhere (in order to receive copyright protection for the binaries) so that it could be released sometime after they failed, assuming no one bought the asset. There would be so much more great software in the world, because the old stuff wouldn’t fade away. I was so dependent on Ecco Pro, and shortly after the PalmPilot, that I bought an external Zip drive to carry it around. Back in the day, Ecco Pro was one of the few programs that you could actually install and run off of portable media. The Zip Drive was my answer to a job that didn’t offer laptops. I suppose a USB drive could do the same trick today. From time to time, I visit the Ecco Pro forums around the net, and wonder where this product could have gone over the last decade, had the company not died.